D-Link rejiggered its small NAS product line back in October, replacing the DNS-320 with the object of our scrutiny today, the DNS-320L ShareCenter 2-Bay Cloud Storage 2000. I last checked in on D-Link's NASes over a year ago with the DNS-325, which now represents the highest-performance two-bay NAS you can buy from D-Link. A basic comparison of the products taken from D-Link's product pages is shown below. It's clear from the summary and, obviously, the product name, that D-Link is attempting to position the 320L as a "personal cloud" solution. The 320L stands a bit taller than other two-bay NASes due to the vertical orientation of the drives. Like WD's My Book Live Duo, drives are inserted from the top and don't require a mounting tray. This means, however, that only 3.5" drives are supported. Before inserting the drives, however, you need to attach a supplied plastic strap that you will need to pull them out. The 3 TB WD Red drives I inserted were a tight fit, requiring a lot of push to get them in. I cringed at the metal-on-metal scraping heard during insertion, imagining little metal shavings gently wafting down onto the main board. The whole process left me thinking I might have damaged something by inserting the drives. 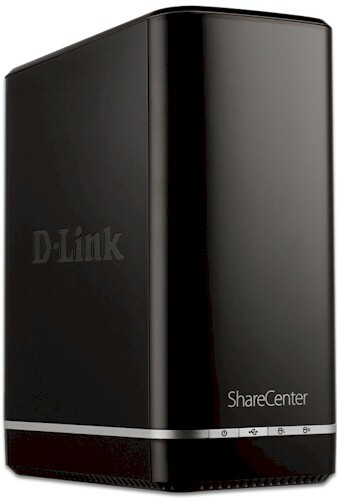 D-Link says the 320L accepts up to 4 TB drives and does not have an approved drive list at this time. The various lights, ports and switches are described in the callout diagrams above and below. As you can see, controls and ports are pretty basic. Only one Gigabit Ethernet LAN port and a single USB 2.0 port are provided for network and external drive and printer connection.